Creamed 175g unsalted butter with 70g castor sugar. Mixed in 175g plain flour, 60g semolina, 20g cocoa and a pinch of salt. Bought it together with my hands and kneaded briefly until all ingredients were incorporated. Rolled out on a flour service to about 1/2 cm thick. Cut four circles from a small saucer and pressed these into 4 9 cm buttered tart tins with push up bottoms. Trimmed the edges with a knife. Bought all the scraps together and rolled out again to the same thickness, then cut out into heart shaped biscuits which I placed on a lined baking tray. Baked tarts and biscuits at 180C for 10 minutes. Mixed 250g mascarpone with 4 tbsp of lime curd. Divided the mixture between the tart cases. Blobbed some lime curd over the surface in an, ahem, arty sort of way. Scattered a little grated chocolate over the tops – using my new grater. The mascarpone lime curd filling was delicious – I could quite easily have eaten the bowlful that I’d made, thankfully I managed to restrain myself. I’m glad I did, because as I’d imagined, it paired extremely well with the chocolate shortbread and was truly delicious. It wasn’t as intensely sherbety as the lime curd buttercream I made, but the flavour was still zingy. CT, who had no idea what these were before tasting them, identified the crust as shortbread straight away. He likes shortbread. He thought the lime was riding the crest of the creaminess and it tasted like real lime too. The contrast of texture & flavour was superlative and it made him want to roll it around in his mouth again and again with his eyes closed. To conclude, he thought it was a superior cheesecake and was pleased to get to eat a whole one all by himself, even if it was rather small. I seriously shouldnt have looked at this post before breakfast! Even more hungry now! Pastry looks amazing! These little tarts look delicious, and it’s a very simple way to make a cheesecake dessert! ahh, these look heavenly Choclette, I love the light creaminess of them combined with the heavy shortbread crust, simply divine… I really want one now!! Chocolate and lime work wonderfully together. These tarts look heavenly! These look wonderful, definitely one I’ll try at some point! These tarts look wonderful and would definitely be a hit with me! 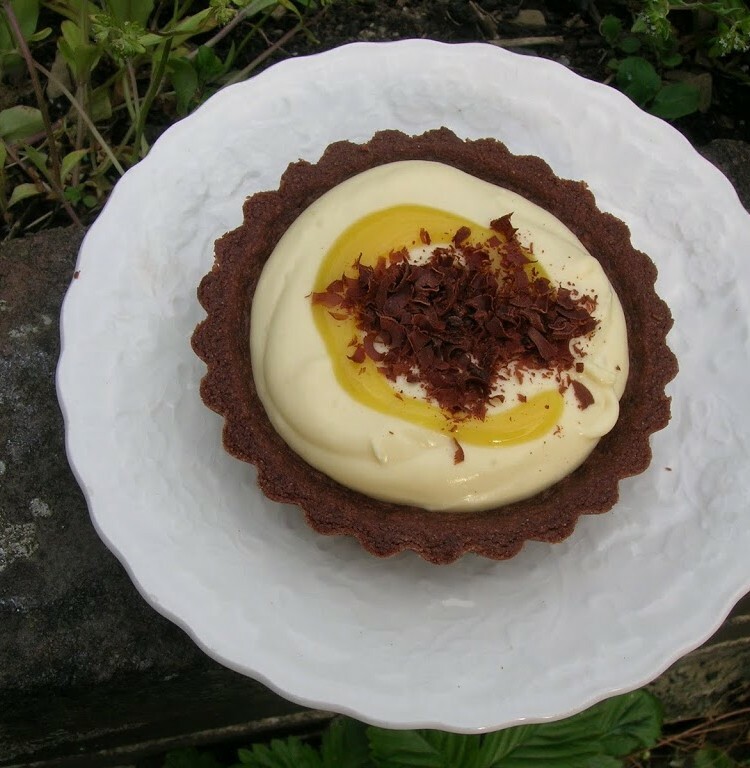 I made some of the Lime & Ginger Curd last week and it was delicious – perhaps I ought to have a go at these tarts too. Only problem is I am trying to lose some weight before I go on holiday – sigh! They look divine! I’m not a fan of citrus things, but I bet that gorgeous shortbread and mascarpone filling would be wonderful with a cherry type curd too! Conratulations and please – can I have your full details on my e-mail? These look like the perfect little treat with a wonderful contrast of textures and flavours! wat a fantastic recipe…absolutely delicious..
new to your space..fascinating colleciton of recipes you have.. These look fab and sure they taste just as good! Aforkful – thanks for enthusiastic response. I’ve come across some very interesting fruit curds recently – so much to try, so little time. Dom – dead simple and would be great at one of your events done in small little jam tart tins. Johanna – oozing is fine by me. I did wonder as to the best way of doing these, but didn’t think about your way. Nice idea. Alice – so worth trying. Xinmei – I’ll be watching your blog to see what wonderful tarts you come up with. Now Serving – thank you. Catherine – I bet you are right there. Liking the idea of cherry curd. Karolina – good news. Thank you. Hazel – thanks. They could probably be littler, but I’d only have had two if they had been. Jay – thanks for the comment and thanks for following. These look so cute, I want some mini tart tins too! The flavour combination sounds delicious. Looks gorgeous! I am on the look-out for mini tart tins. They are good both for sweet and savoury. Am loving the chocolate pastry – the tarts look so professional! Hmmm. Chocolate lime sounds fantastic – but with that lime and ginger curd, too? Heaven! Love the combination of flavours in there. You’ve described it so well that I feel I just tasted one. Merci ! Baking Addict & LF – thank you. These tins were one of the better buys I’ve made – well worth having. CC – thank you kindly – I shall be using the chocolate shortbread pastry again. Just need to think of a few more things to fill the tarts with. Not too difficult a task I suspect. trust me I’m dead seeing those tart, mascarpone is my current obsession! can’t get enough of it…ur tarts are darn cute! They look fabulous – a great use of the chocolate shortbread recipe, the tins and the curd. Lovely combo! Ananda – You can probably tell, I’ve got the mascarpone obsession now too! C – thank you. Sometimes (quite often in fact) the simpler things are the best. These look beautiful. I might have to play with something similar. Curd is such a delicious thing to put in anything. My trouble is if it’s in the house, I have a naughty habit of eating it just with a spoon and it doesn’t actually get anywhere near a dessert. So will mascarpone be back? This looks yummy….you have a lovely blog…I am having a giveaway in my blog..Y dont you check and join that. Aarthi – thank you for your kind comment and apologies for taking so long to spot it!